All of us here at Team LC know just as well as the next working girl how important it is to have a healthy yet filling lunch to bring into the office. Preparing the same old salad for months might seem like a healthy routine, but we can guarantee you won’t be excited to open that brown paper bag after a while. On the other hand, indulging in catered work lunches on a weekly basis is delicious, but pastas and pizzas will definitely start to take a toll on your waistline. The solution? Homemade earth bowls. The term “earth bowl” was new to us before chef Marlene Bernstein of Savour This Kitchen told us about these fresh takes on a traditional salad. Needless to say, we were sold. For the quinoa: In a pot over medium heat bring 1 cup of quinoa and 2 cups of seasoned vegetable stock to a boil (Remember that however your liquid tastes is how your grain will taste). Reduce to a simmer, cover and cook covered until all water is absorbed. (approximately 12-15 minutes). When done, remove from heat and keep covered. To blanch your broccoli: Bring two cups of salted water to a boil. Prepare an ice bath to cool the broccoli after cooking. Cut broccoli into 1-inch pieces and then drop into boiling water. Cook for approximately 2 minutes until bright green and tender but still firm. Remove from boiling water and drop into ice bath to stop cooking process. Drain and then cut broccoli into thin pieces lengthwise. Assembly: Place your quinoa on the bottom of your bowl. Layer your carrots, tomatoes, broccoli, kidney beans and sliced red onions on top of the quinoa. Making the Harvest Dressing: Add all dressing ingredients in a blender and pulse. Then, drizzle bowl with dressing. Sear your ahi tuna: Coat your sauté pan with olive oil and bring to high heat. Season your fresh, sushi-grade ahi tuna with salt, pepper and ½ tsp of fresh fine chopped thyme. Lay ahi tuna in the pan for about 1 minute per side, forming a nice crust on both sides, but not cooking the ahi tuna entirely through. You want the sear to be as even as possible. Once cooked, remove the ahi tuna from pan and allow to rest. Slice into ¼ in thick strips to fan out over bowl. Assembly: Place your quinoa on the bottom of your bowl. Layer your peanuts, carrots, edamame, red onion, avocado, ahi tuna and chives on top of the quinoa. To make the dressing, add all dressing ingredients in a blender and pulse. Then, drizzle your bowl with dressing. Tip: You can easily make these dishes ahead of time. Pack it for work or have one ready for dinner by simply keeping the dressing separate to avoid making the ingredients soggy. Just add the dressing right before you eat! 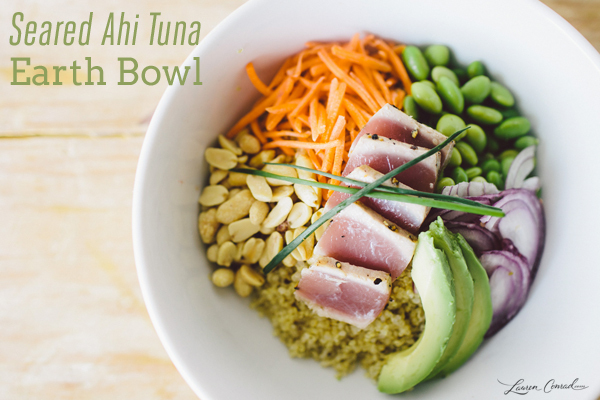 If you love fish or sushi, the Ahi Tuna Earth Bowl above is for you. 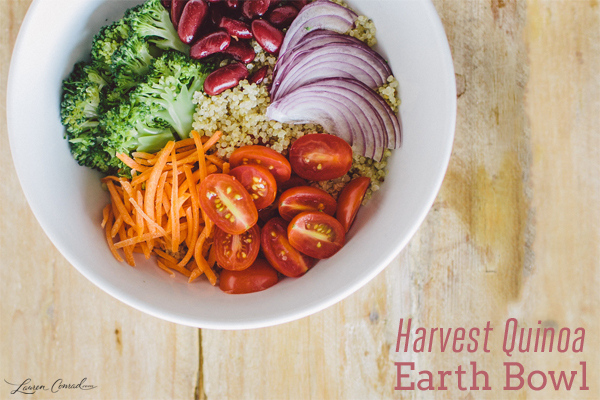 And if you’re a vegetarian or vegan, try the Harvest Quinoa Earth Bowl! They’re both delicious and a great way to get lots of veggies and nutrients into your diet. 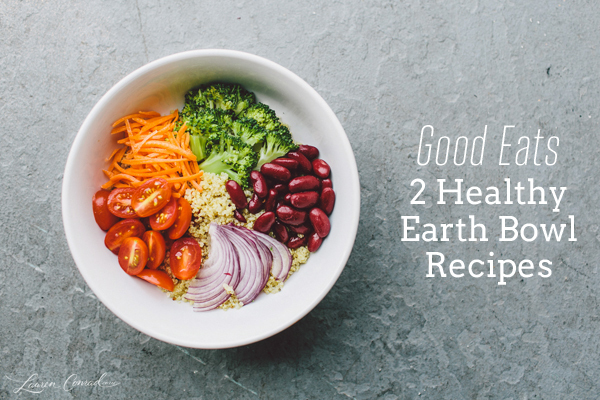 What will you add to your earth bowl? Let us know how you will customize yours in the comments below.